Katherine Skaggs is inspired to bring beauty, love, soul healing and a vision of inspiration to others through archetypal art, empowering coursework, and intuitive guidance and healing services. Join Katherine for a private session to receive a divinely guided, channeled portrait, alive with vital, high-frequency energy, providing healing, awakening, soul retrieval, soul remembering and inspiration. 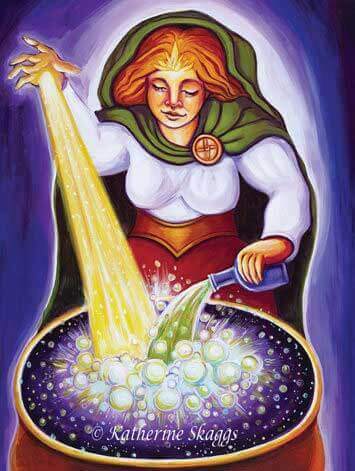 Katherine Skaggs is in the process of creating the new 44 card Masters of Light Wisdom Oracle! This visual inspiration and spiritual travel guide brings to you the wisdom of Ascended Masters, Goddesses, Angels and Divine Beings of Light who are here to awaken your Inner Mastery, Light & Wisdom! These beautiful images are portals into dimensions of power and support. Easy-to-use tarot and blessing cards will bring joyful transformation to you and your world whether you are a beginner or a seasoned reader. Katherine works with you to return balance of spirit, in all realms. This applies to not only one’s human body, but all aspects of your life. Below are just a few samples of Katherine Skaggs original art. You can click the button to see it all! Katherine works as a clear channel along with the assistance of the Mythical Goddess Tarot to give you guidance and clarity on your life path. The readings open a space for healing and trust of Spirit’s path for you, and how to gain objectivity in your life.